The discovery of bronze artefacts from c. 3,000 years ago in the Ballinrobe area, proves that blacksmiths practised one of the oldest crafts here. 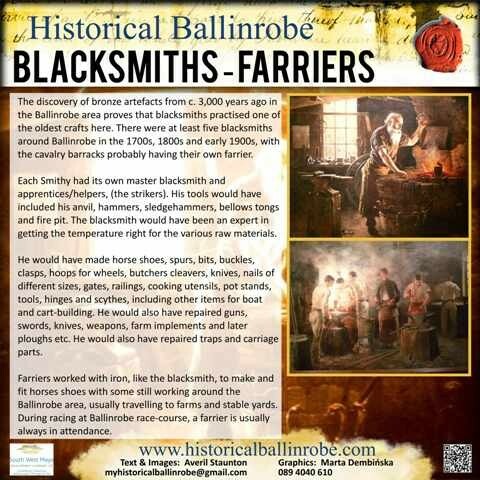 There were at least five blacksmiths around Ballinrobe in the 1700s, 1800s and early 1900s with the barracks probably having their own farrier. Each Smithy had its own master blacksmith and apprentices/helpers, (the strikers). His tools would have included his anvil, hammers, sledgehammers, bellows tongs and fire pit. The blacksmith would have been an expert in getting the temperature right for the various raw materials. He would have made horse shoes, spurs, bits, buckles, clasps, hoops for wheels, butchers cleavers, knives, nails of different sizes, gates, railings, cooking utensils, pot stands, tools, hinges and scythes including other items for boat and cart-building. He would also have repaired guns, swords, knives, weapons, farm implements and later ploughs etc. He might also have repaired traps and carriage parts. Farriers worked with iron, like the blacksmith, to make and fit horses shoes with some still working around the Ballinrobe area, usually travelling to farms and stable yards. During racing at Ballinrobe race-course a farrier is always in attendance. This page was added by Averil Staunton on 25/01/2014. Sorry, I made a mistake in the dates. The Sheridans were blacksmiths in the late 19th and early 20th centuries. My great-grandfather John(? 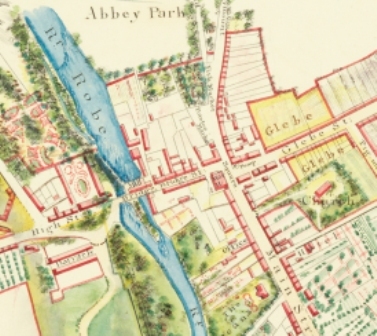 )Sheridan and later, his son Martin Sheridan, were blacksmiths in Ballinrobe late 18th and early 19th centuries.